Naga Chaitanya’s Savyasachi completed all formalities and is releasing on 2nd November. The producers are trying to not spend too much on pre-release promotions but they have plans set for post release functions along with Amar Akbar Anthony. They are confident about the movie and the inside reports suggest some interesting things too. Well, both the sources have revealed similar talk and we have to say they are not those people who are easily pleased. The low key promotions are worrying fans a bit, but the director and producers are looking for the first day talk to be out for the film and confident that it will be very positive. 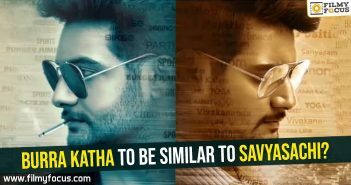 Burra Katha to be similar to Savyasachi?